Liposuction is a method for removing excess body fat in order to improve body shape. The best candidates for liposuction are individuals who have localized excess areas of fat such as in the lower abdomen, saddlebags, neck, etc. Liposuction can be performed on all parts of the body and in conjunction with other procedures such as the neck and body lift. 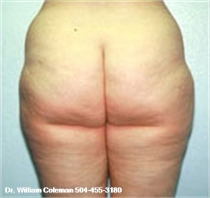 Patients who are significantly overweight usually do not benefit from liposuction. The ideal patient is within 10-15 pounds of their ideal body weight and committed to exercise and proper eating. Breakthroughs in anesthesia now allow liposuction to be performed entirely using local anesthesia without the need for hospitalization. This avoids the dangers of general anesthesia and makes the recovery time much faster. 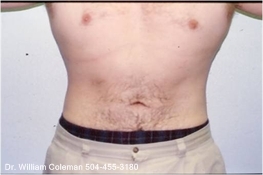 Dr. Coleman, Metairie dermatologist, is one of the original pioneers of local anesthesia liposuction, and he has served as an invited guest professor teaching this method all over the world. 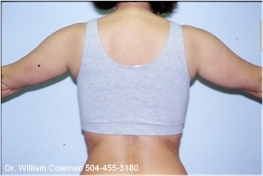 Our patients feel good immediately after their liposuction at our New Orleans / Metairie location, and usually have little or no post-operative pain. Most of our patients are able to drive and participate in light exercise the day after surgery. You can find advertisements all over the internet for “laser liposuction” and “smart" liposuction (smartlipo) or "water jet" liposuction or "ultrasonic" liposuction. Beware Many of those advertising these procedures are general doctors with absolutely no training in surgery or liposuction, except for a weekend course from the company that sold them the device. It is no wonder that they are confused about the benefits of these instruments in liposuction. And worse, we are seeing increased complications from liposuction performed by untrained doctors. It takes an experienced expert to use this equipment properly. Patients should ignore all these gimmicks and choose an experienced liposuction surgeon. We employ state of the art equipment for our liposuction. We constantly evaluate the latest lasers, ultrasonic devices, and powered devices. 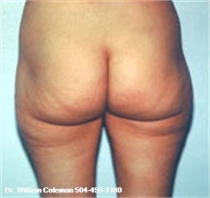 TLC LiposculptureTM is an advanced laser method to improve skin tightening during liposuction. 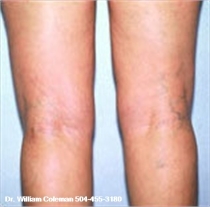 Dr. Coleman developed TLC LiposculptureTM , using external lasers and light sources on the skin the same day as liposuction to achieve additional skin tightening. The key to good results is finding an experienced surgeon, such as Dr. Coleman who has performed liposuction on thousands of satisfied patients from all over the world. We are especially proud that hundreds of physicians, nurses, and their families have chosen us for liposuction. 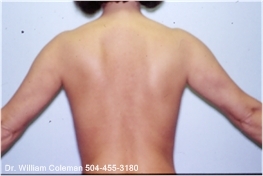 Metairie dermatologist Dr. Coleman is one of the original pioneers of liposuction. 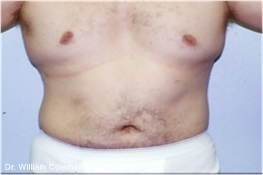 He was one of the first physicians in the U.S. to learn and perform liposuction when it was first introduced in 1983. Dr. Coleman is recognized as an international authority in this field, serving as an invited guest professor to teach liposuction in South America, Europe, Asia, Africa, and Australia. 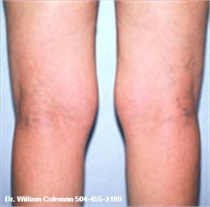 Dr. Coleman’s experience in this area also allows him to advise you when non-surgical options such as Cool Sculpting or UltraShape are appropriate. 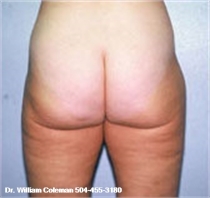 Of his over 300 scientific publications, 50 are on liposuction. He is also the co-author of three books on liposuction. If you would like a copy of his book: "Body Contouring: The New Art Of Liposculpture", it is available free to patients who visit us for a consultation. Or, to order a copy, call LL Cooper Publishing at 231-933-9958. CoolSculpting is a revolutionary, non-surgical treatment option that uses cold energy to freeze fat cells until they are destroyed and reabsorbed by the body. Performed within an hour or two, it’s ideal for shrinking away small areas of fat on individuals who are already at or near their ideal body weights but looking to shrink localized fat pockets without surgery. UltraShape is a treatment that destroys fat cells in a series of three treatments that are spaced two weeks apart, using ultrasonic energy. 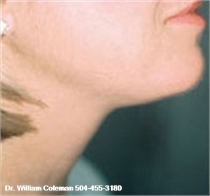 Experts in dermatology in Metairie and New Orleans, LA, Drs. 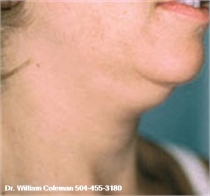 William and Patrick Coleman were among the first doctors in the U.S to perform this procedure. They both served as investigators for the FDA approval process and are ready to advise you on treatment. Cellfina® uses a microblade system to treat the unwanted dents and dimples associated with moderate to severe cellulite. The result is healthy, smoother looking skin that has been shown to last three years or, in many cases much longer, the longest approved duration for cellulite treatment.